Mercedes-Benz E-Class Boot Space, Size, Seats | What Car? You sit fairly high up in the E-Class, but there’s plenty of front head room – even in versions equipped with a panoramic glass roof. The front seats also slide back a long way to accommodate those with longer legs. Front storage space is decent, too. The gloss black centre console features a lidded cubby that houses two cupholders, and there’s more stowage space below the front centre armrest. The door pockets are a good size, too. There’s a lot of leg room in the back and, although foot space is a bit tight under the front seats, the rear footwells are big enough for this not to present too much of a problem. Head room is more of an issue, though, and is certainly tighter than in key rivals, such as the BMW 5 Series and Jaguar XF. 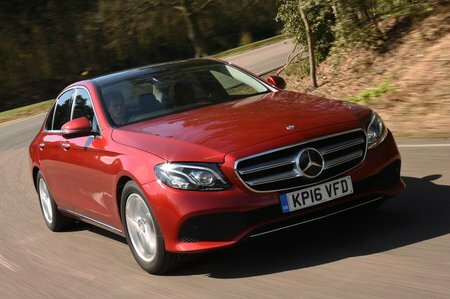 That said, all versions of the E-Class we've tried so far have been equipped with an optional panoramic glass roof, which may have been partly to blame. As is the case in most rivals, whoever sits it the middle seat in the rear has to straddle a hefty transmission tunnel and will suffer even less head room. The E-Class officially has a slightly bigger boot than the 5 Series and A6, and there’s certainly enough space for a couple of sets of golf clubs or large suitcases. The saloon opening is fairly narrow, though, which can restrict loading. If you’ve specced the optional split-folding rear seats, you’ll be able to drop the rear seatbacks by pulling handles in the boot. The extended load bay has a slight hump in the floor but this doesn’t really get in the way. A powered tailgate is on the options list but is available only as part of the expensive Premium Pack.